After Smoking Is Banned, Heart Attacks Drop : Shots - Health News Bans on smoking in bars and workplaces appear to reduce heart attacks and deaths within months. The savings on health care spending were significant, too. Researchers say the findings provide strong support for limits on smoking indoors. 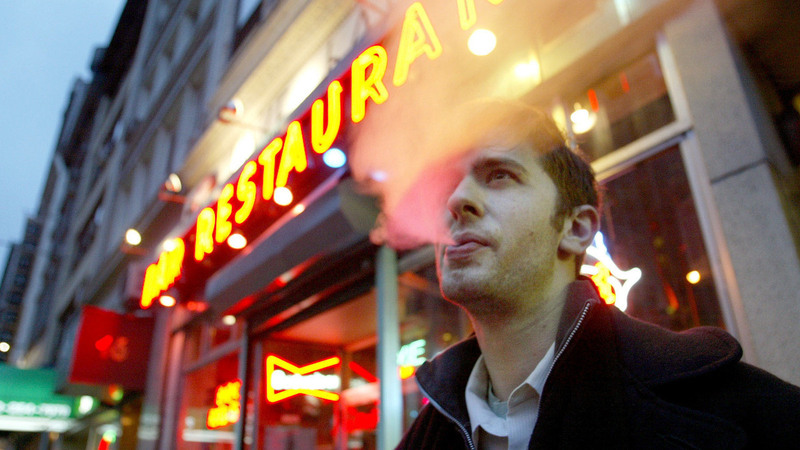 David Ozanich smoked outside the Live Bait bar in New York City in April 2003, a few months after a ban on smoking in bars and restaurants took effect. When smoking is banned in bars and workplaces, the number of people who suffer heart attacks and die drops within months, according to two new studies. They found benefits not only in saving lives, but in lowering the cost of medical care for heart attacks, stroke and other smoking-related illnesses. It's the best evidence yet demonstrating big, swift health improvements when secondhand smoke is banished. "We should now accept this as fact," says Richard Hurt, a professor of medicine at the Mayo Clinic who led one of the studies. Tobacco industry arguments that secondhand smoke isn't a major risk factor for heart disease, he says, are "just nonsense," because the only risk factor that changed in those 18 months was secondhand smoke. People's cholesterol and blood pressure stayed the same, and obesity rates increased. Doctors should tell patients that avoiding secondhand smoke is something they can do to avoid heart disease, Hurt says, just like lowering cholesterol and blood pressure, and maintaining a healthy weight. "People with known coronary disease should have no secondhand smoke exposure," Hurt says. "It is too dangerous." That's bad news for people in the 24 states that don't have comprehensive smoking bans, especially if they like to hang out in casinos or bars, the places most likely to be shrouded in a haze of tobacco smoke. About half of states have laws banning smoking in all indoor public spaces, according to the federal Centers for Disease Control and Prevention. Others may ban smoking in restaurants but not bars and casinos, or let people smoke if the space is ventilated. The new study looked at medical diagnoses in Olmsted County, Minn., site of an ongoing study funded by the National Institutes of Health. Hurt and his colleagues found that the number of heart attacks there dropped by one-third in the 18 months after a strict ban on workplace smoking went into effect in 2007. An earlier state law banned smoking in restaurants, but allowed it in bars and some workplaces. The number of sudden deaths from heart attacks decreased by 17 percent, but there weren't enough deaths overall to make that a reliable number, Hurt told Shots. His study was published online in the Archives of Internal Medicine. The stricter the law, the fewer people landed in the hospital. "It's just a gigantic effect," says Stanton Glantz, director of the Center for Tobacco Control Research and Education at UCSF, and a leader on the study. "There's nothing else you can do that's going to have that big an effect that fast." The findings appear in the journal Circulation. Politicians should take note, Glantz says, because backing strict smoking bans would get them immediate payback not just in constituents' health, but in savings on health care costs. Those benefits would far outweigh tax revenues from bars and casinos, Glantz adds. Loss of business to casinos and bars is a key talking point for smoking advocates.